Begining with Free Study challenge launched earlier today (Free Study 2011-04) and for every monthly Free Study challenge for the remainder of the year, we'll be offering a unique prize to all Blue Ribbon winners. 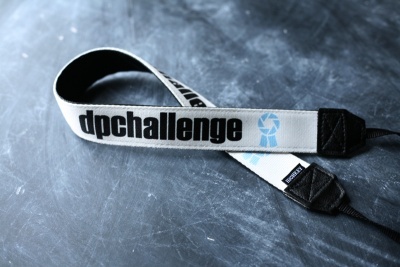 We've teamed up with HighKey Camera Straps to bring limited edition camera straps to the best of the best here at DPChallenge. In case you weren't paying attention -- there are only 9 of these straps up for grabs since we're announcing this on April 1st. That should give you an idea of how limited these are -- only 9 of them will be in existence. In addition to the 9 remaining Free Study challenges, 3 more straps will be given away to the top 3 finishers for the Best Of 2011 challenge that will inevitably be announced next January. These straps will be unique to the Best Of 2011 challenge and each will have a uniquely colored ribbon indicating place. Message edited by author 2011-04-01 10:10:41. LOL, Hmmmm, an April 1 announcement. Coincidence? We hope you're as excited about this as we are! Message edited by author 2011-04-01 10:32:55. But what's the worst that this will do? It'll encourage us to take good photos... what't the harm in that? Uhmm.... is it an April fool joke? I must admit that its a great idea but the "shipping to Iceland" scares them is a little.... fishy. Well, when you consider that Narwhals don't make the transit from the USA to Iceland very often, and charge accordingly, I think Langdon is right to be concerned about shipping charges. I'm still rather proud of that one! Proudly hosted by Sargasso Networks. Current Server Time: 04/25/2019 09:46:33 AM EDT.